Second day in Prague the big K and I had to start out early. We had to pack our bags and transfer to another hotel. When I made the booking at this Náměstí Republiky hotel a few months ago I think I was having a dyslexic moment as I got the dates all mixed up (well, at least we have a place to stay at next year!). Long story short, we had to look for another hotel as they were fully booked. Thanks to Trip Advisor, we found an inexpensive hotel in the Smichov area (Prague 5). Taking the metro to Andel, we arrived at Aparthotel City 5 and was greeted by the red-haired, vivacious owner, Kristina. "Hello, hello! Good morning! Welcome! How do you want your coffee?" Talk about a very warm welcome on a very cold day. All at once the big K and I felt at home. Kristina offered us breakfast with our coffee but the big K and I declined since we wanted to head off to the Castle early to beat the crowds. Since it wasn't check-in time yet, Kristina stored our bags and gave us a map with instructions on how to get to the castle district. The massive and awe-inspiring St. Vitus Cathedral. Hopping on the number 22 tram, the big k and I were off to Hradčany (Castle District). There are five ways to get into the castle grounds according to the Prague Castle website. The big K and I took the fastest and easiest way (of course!) which was getting off at the Pražský hrad (Prague Castle) tram stop. Castle tickets are valid for two days, the day of the purchase and the next day. The big K and I got the short visit tickets that each cost 250 Kč and a photo license/permit for 50 Kč. This is the first time I've ever encountered buying a photo license to take pictures of an attraction's interiors. And yes, Prague is big on these photo permits. No permit, no photos! when the fountain was made. 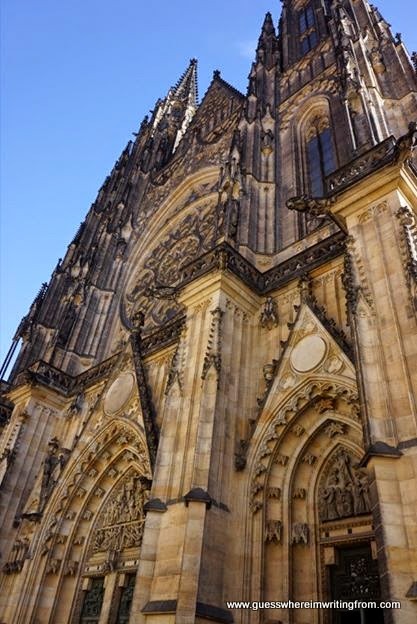 We've seen some Gothic churches in the past but St. Vitus Cathedral was Gothic on steroids! whiskey-swilling, gun-toting big brother. The one with facial scars." The big K couldn't help humming Sesame Street's the Count entrance song when he saw the cathedral's pipe organ. St. John of Nepomuk's all silver tomb. Saint John of Nepomuk is the national saint of the Czech Republic. The story goes that he was the confessor of the queen of Bohemia. When King Wenceslas, King Of Bohemia suspected the queen of having an affair and wanted to find out the name of her lover from her confessor, St. John refused to divulge the confession. He was then drowned in the Vltava river. And because of the way he was martyred, St. John is considered as the protector from floods. Basilica of Saint George is tiny compared to St. Vitus cathedral. Founded by Vratislav I of Bohemia in 920 the Basilica of Saint George is the oldest surviving church building inside the Prague Castle. The church holds the tomb of Saint Ludmila of Bohemia, the mother of Vratislav I and grandmother of Saint Wenceslas who is immortalized in the Christmas carol "Good King Wenceslas". Oh, by the way this is a different Wenceslas from the one who had Saint John of Nepomuk killed. in the 1100s and was mainly used as a prison. Mala Strana as seen from the castle bastion walls. The Old Castle Stairway connects Prague Castle to Mala Strana. Seriously?!?! A photo license permit! First time I've heard about one too! Good thing they allow it because some establishments in Europe just forbid taking pics. Based on your pics, I am definitely getting one of those permits.